Happy weekend! 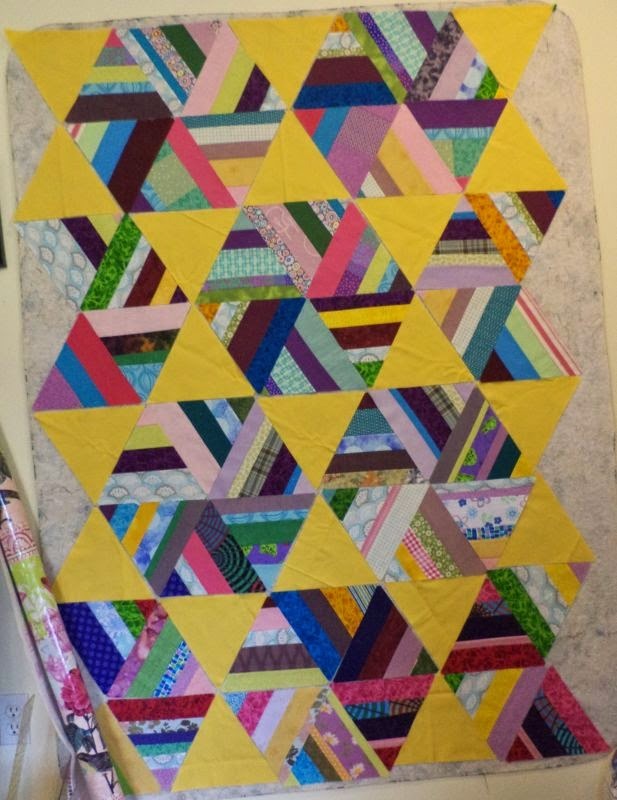 I am celebrating by pulling out the rest of my scrappy string triangles and playing on the design wall. If you remember the String Braid quilt made around the new year, these are the rest of the triangles that didn't go into that quilt. I have a few design options here. The traditional spider web as above. ...or the pinwheel hexies shown here. I think I like the second one better, please let me know what you think! I might also try Bonnie's serpentine layout seen here. I like option two as well. The yellow makes it such a happy quilt. Such silly kittys! I like both quilt options, they are both awesome! I think you can't go wrong with either option. What a fun pattern. Thanks for sharing with Oh Scrap! I really like the pinwheel layout, but can definitely see the possibilities with the serpentine. What a fun quilt. My vote also goes with Number two=it really stood out for me. I cannot believe your two cats curl up in the tub like that. Mine do not even sleep near each other!! I think the second option is my favorite- it really has a great sense of movement. 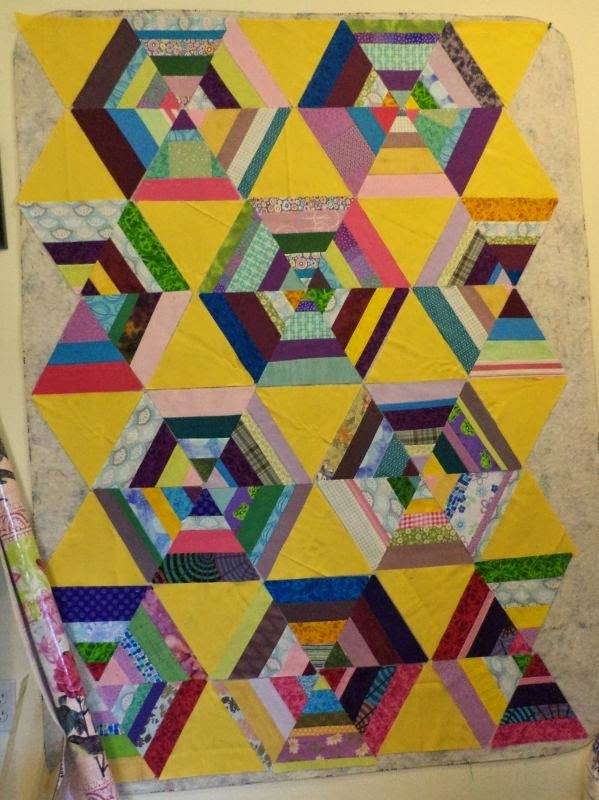 The yellow in this quilts looks good. Yellow is a color I don't think to use very often, but it adds a lot of interest to your design. I like the second one better too, but they are both great! String quilts are one of my all time favorites. This is a happy quilt with your yellow background, but still grounded. I think it will have a funky, modern feel when you're done. Keep on it. I like both ! I'm a fan of your quilts, they're fantastic ! 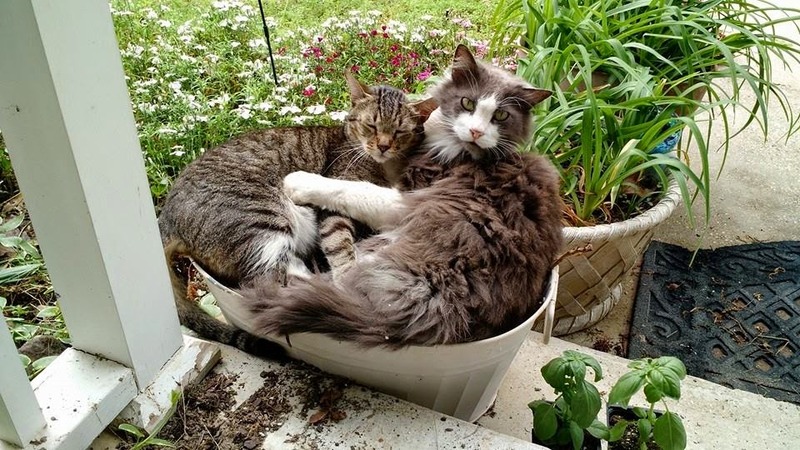 And your cat flowers are amazing :-))))) I like cats lying together. Unfortunately ours never do.